As the North Pole is made up completely of sea ice, it may mean that Santa Claus will have to transfer his operations elsewhere. 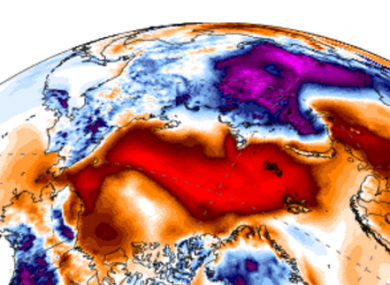 Temperatures in the North Pole could rise to close to zero today. TOUGH TIMES AT the North Pole: The Arctic is undergoing a heatwave, with temperatures possibly reaching up to 20 degrees higher than its average for December. Average arctic temperatures in November and December were 5 degrees higher than average, according to an investigation into whether man-made global warming is causing the Arctic to warm. The report, published on Wednesday, found that the probability of such warm temperatures happening before industrialisation was “so small it is hard to estimate”. The BBC and New York Times are reporting that Arctic temperatures could rise to just 0 degrees today, a record. As the area around the North Pole is made up completely of sea ice, it may mean that Santa Claus will have to transfer his centre of operations elsewhere. Dr Friederike Otto, a senior researcher at Oxford’s Environmental Change Institute told the BBC that in pre-industrial times “a heatwave like this would have been extremely rare – we would expect it to occur about every 1,000 years”. She added that scientists are “very confident” that the weather patterns were linked to man-made climate change. There were also temperatures of close to 0 degrees in the North Pole last year, while the Arctic sea ice reached its second-lowest extent ever recorded by satellites last summer. Last week, the National Oceanic and Atmosphere Administration, a US federal agency, released its 11th Arctic report card. The rapidly thinning ice shocked researchers. Among its findings, the average surface air temperature for the year ending September 2016 is by far the highest since 1900. New highs were recorded in November 2016. Rarely have we seen the Arctic show a clearer, stronger or more pronounced signal of persistent warming and its cascading effects on the environment than this year. Spring snow cover extent in the North American Arctic, meanwhile, was the lowest in the satellite record, which started in 1967. The Greenland ice sheet continued to lose mass over 2016, meanwhile. Images show the contraction of Arctic Sea ice, even over the last few days. In recent years Santa has been spending more and more time on terra firma in Lapland, in Scandanavia. Yet, there, lower temperatures caused by global warming have led to smaller reindeer, as they cannot get at their favourite food – lichen. It’s also warming up on the South Pole, with Antarctic sea ice at record low levels. Email “Record temperatures as the North Pole gets a heatwave for Christmas”. Feedback on “Record temperatures as the North Pole gets a heatwave for Christmas”.